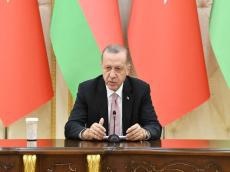 Turkey will do everything possible to resolve the Nagorno-Karabakh conflict, Turkish President Recep Tayyip Erdogan said in Baku July 10 during the joint statement to the press with Azerbaijani President Ilham Aliyev. "Previously, Turkey has also supported Azerbaijan in the issue of resolution of the Nagorno-Karabakh conflict, as well as in the issue of assistance to Nakhchivan," Erdogan said. He noted that, if necessary, it will be possible to build a railway between Turkey and Nakhchivan in the future. "The development of transport links between Turkey and Azerbaijan is in the interests of our countries," Erdogan said. He noted that, Turkey is also ready to provide medical assistance to residents of Nakhchivan on the territory of Turkey. Erdogan noted that, the relations between Turkey and Azerbaijan in the sphere of defense are also developing. "Turkey is ready to transfer its experience in the defense sector to fraternal countries," Erdogan said. Erdogan also thanked the President of Azerbaijan for his support in the fight against Gulen terrorist organization. The President of Turkey Recep Tayyip Erdogan has arrived in Azerbaijan today as the newly elected President.